Panoramic radiography is often used in dental practices because it is readily available and provides a view of many structures of jaws at low cost and less radiation. However, a panoramic radiograph is a two-dimensional image and accurate measurements are difficult to obtain because panoramic views produce a variable inherent magnification distortion, typically 20-30%. Assessment of alveolar bone, identification and location of mental foramen, nasal floor, and maxillary sinus are critical, particularly in presurgical implant planning. Furthermore, the adult sinus floor extends between adjacent teeth or between individual roots, creating elevations in the antral surface (hillocks) or protrusions of root apices into the sinus, in which case the thickness of the sinus floor is markedly reduced. Hence, the aim of the study is to know the accuracy of panoramic radiograph in the assessment of relation between maxillary sinus floor and posterior teeth roots; and nasal floor. Three hundred and eighty-eight roots of maxillary second premolar, first and second molars in 30 subjects were classified and measured. The number of teeth roots classified in the study is listed in [Table 1]. It was observed that 61.6% of all roots showed class 1 in panoramic radiograph, while 71.1% showed class 1 in the CBCT image. The change in the classification of roots in CBCT image from one class to the other in the panoramic radiograph is listed in [Table 2]. There was a significant change in the classification with chi-square value of 192.637 and P value of 0.000. There was a significant deviation of panoramic radiograph from the CBCT image in assessment of distance of alveolar crest to nasal floor with a P value of 0.018 as shown in [Table 3]. The present study has been conducted to know the reliability of panoramic radiograph in clinical practice by comparing it with that of CBCT which is considered as standard. Most of the studies found only the relationship of floor of sinus to maxillary posterior teeth roots, ,,,, but did not specify the change in classification from one class to the other on different radiographs. Only one study showed change in the classification in panoramic radiograph and CBCT images. The present study correlated the relationship of floor of sinus to maxillary posterior teeth roots, as well as change in classification, percentage of change and its significance in panoramic radiograph and also in the CBCT image. In the present study, 72% of the cases showed the same classification in both the CBCT image and panoramic radiograph. 62.1% of class 0, 85.8% of class 1, and 21.1% of class 2 showed the same classification in both CBCT and panoramic radiographic images. Class 0 was most frequently observed in second premolar, class 1 in distobuccal and palatal roots of second molar, and class 2 in palatal root of first molar in panoramic radiographs and CBCT images. 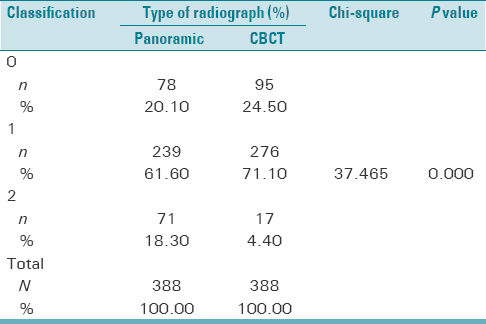 Also, 28% showed change in classification in panoramic radiograph; 37.89% of class 0, 25.72% of class 1, and 11.76% of class 2 in CBCT images showed change in classification from one class to the other on panoramic radiographs. Nimigean et al. reported that the second molar had the most intimate antral relation, i.e., 93.9% of the second molars showed close relationship with the maxillary sinus floor. The present study also showed that the second molar was closest to the sinus floor, of which 78.5% of distobuccal and palatal roots were closest to the sinus floor, and of all the teeth showing close relationship, the second molar represented 33.5%. Jung and Cho showed that the distance between the sinus floor and the root of the molar was shortest for the mesiobuccal roots of second molar and longest for the palatal roots of second molar. The present study also showed that the mean distance of palatal root of second molar from the floor of sinus was longest, but it was shortest for distobuccal root rather than mesiobuccal root of the second molar. The present study showed that there is high correlation between CBCT and panoramic radiograph in subjects with roots classified as class 1 (in contact with the floor of sinus). In these cases, two-dimensional panoramic images are sufficient to provide the clinician with information about the true relation between teeth roots and sinus. 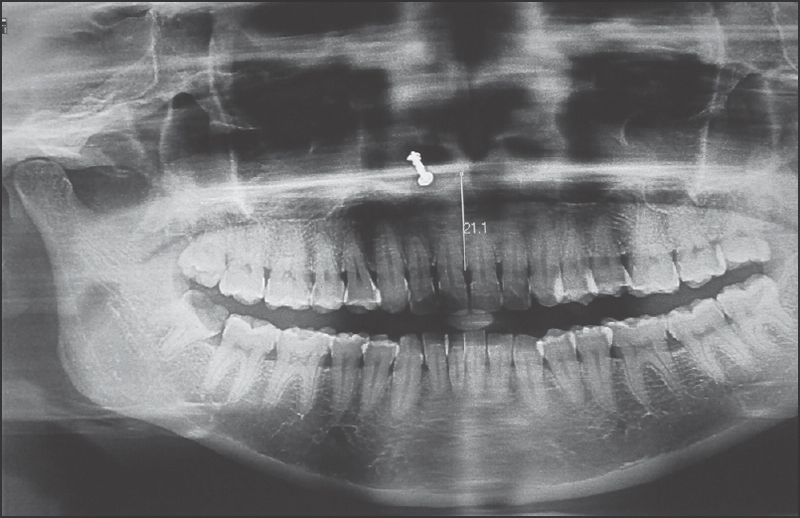 Panoramic radiograph is less reliable in assessment of distance between the crest of alveolar bone and the nasal floor, and CBCT is preferred over it. Pires CA, Bissada NF, Becker JJ, Kanawati A, Landers MA. Mandibular incisive canal: Cone beam computed tomography. Clin Implant Dent Relat Res 2012;14:67-73. Sharan A, Madjar D. Correlation between maxillary sinus floor topography and related root position of posterior teeth using panoramic and cross-sectional computed tomography imaging. Oral Surg Oral Med Oral Pathol Oral Radiol Endod 2006;102:375-81. Damante JH, Filho LI, Silva MA. Radiographic image of the hard palate and nasal fossa floor in panoramic radiography. Oral Surg Oral Med Oral Pathol Oral Radiol Endod 1998;85:479-84. Hassan BA. Reliability of periapical radiographs and orthopantomograms in detection of tooth root protrusion in the maxillary sinus: Correlation results with cone beam computed tomography. J Oral Maxillofac Res 2010;1:e6. Nimigean V, Nimigean VR, Mãru N, Sãlãvãstru DI, Bãdiþã D, Tuculinã MJ. The maxillary sinus floor in the oral implantology. Rom J Morphol Embryol 2008;49:485-9. Jang HM, Kim JW, Kwon TG, Jang HJ, Kim CS, Lee SH. 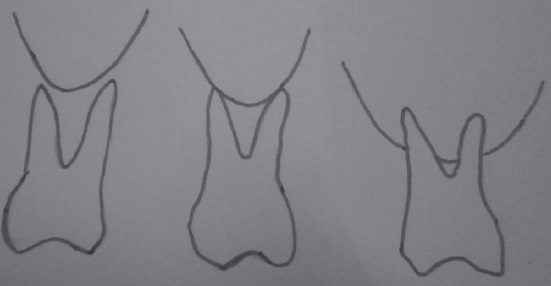 The measurement of vertical length from the root tip of maxillary anterior teeth to nasal floor, when maxillary anterior implants placed. J Korean Assoc Maxillofac Plast Reconstr Surg 2012;34:326-31.